This hollow body article saw a few changes to the chart. We removed a couple of models such as the Epiphone Masterbilt Zenith Classic and Oscar Schmidt OE30. These were replaced with three new guitars, including the higher-end Guild Starfire V, as well as the LH-302T from The Loar. We also added the affordable Johnson JH-100-WNB Delta Rose, which is a strong choice for beginners. What do B.B. King, John Lennon, Paul McCartney, Keith Richards, George Benson, and Brian May all have in common? Are Hollow Bodies For Me? Come on, it’s easy! They have all enjoyed recording and gigging with hollow bodied guitars, and have created some of the most iconic music on these wonderful instruments. 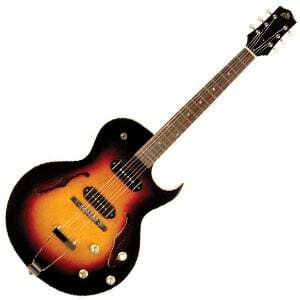 More than 80 years after Gibson first invented the hollow body electric guitar, they keep growing in popularity. A remedy to some of the aggressive, rock-fueled modern solid bodies, players are attracted to these traditional hollow bodies as they can provide the best of both acoustic and electric tones. There’s something beautiful about a hollow body. Perhaps it’s the traditional vintage look and feel, combined with the powerful, rich and well-rounded sounds on offer. And while they certainly aren’t for everybody, as we explain below, they are capable of producing tones that solid bodied instruments struggle to. These days there are so many exceptional hollow bodies on the market competing for your attention, which is great for us consumers! Godin produce a Canadian masterpiece with the Kingpin II. A classy model with an outstanding design. 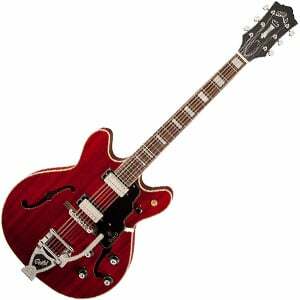 One of the best-looking guitars on this list from Hagstrom. A pristine Wildkat that oozes class. A beautiful looking Ibanez with a great sound. A versatile vintage thinbody archtop that’s great for jazz, blues and country. An art deco wonder from Gretsch. A superb semi-hollow for soft rock. Good style, tone and value from an affordable hollow-bodied guitar. Even if it’s incredibly obvious, it’s worth mentioning that this style of guitar is much more suited to specific genres of music. For example, jazz, country, blues and soft rock styles can all benefit from the presence of a hollow bodied guitar. So, before we start our breakdown of the best on the market, a word of warning to beginners that have a passion for punk, rock or metal – you’ll be much better off learning with a solid body electric guitar. Again, more on the reasons why later. Still keen on hollow bodies? Great, because we’ve tried and tested some of the best around, and have summarized the best in their categories. Check out our list, and keep reading for more advice on purchasing a hollow body. Part of Guild’s Newark Street Collection, this 1960s-inspired semi-hollow body guitar features a gorgeous retro design, whether you go for the black, white or red finish. The build and craftsmanship on this laminated maple model are very commendable, while the three-piece mahogany/maple neck is a pleasure to play, with its soft U shape. 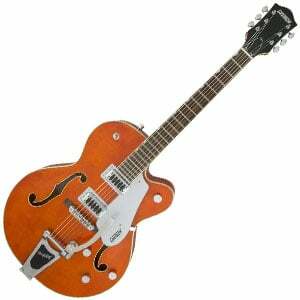 Guild ensures the hardware is period-correct, although it has all been upgraded to deliver superb reliability. It’s loaded with two Guild-designed ‘Little Buckers’ at the bridge and neck position, delivering a warm, clear and balanced tone that sits somewhere between a traditional humbucker and a single-coil. Great for blues, rock and jazz. There’s more on the versatile Starfire V in the full breakdown. Godin are kings when it comes to acoustic guitars, and they have excelled themselves in the hollow body electric range with this wonderful instrument. Combining true 50’s style with modern components and playability, the 5th Avenue Kingpin II – reviewed in full here – deserves attention. The body is crafted from Canadian wild cherry with a molded arched top and back, and is finished with a sleek 19th century-style French polish that leaves a slender satin sheen. It also features a silver leaf maple neck, with a rosewood fretboard and 21 frets. As for the voice, there are two Godin Kingpin P90 single-coil pickups, which offer formidable sound quality, with enough versatility to cater for many different styles. Well worth the money. This beauty from Gretsch is a top contender for the best guitar on this page (and also featured on our best guitars under $1000 list), with a snazzy vintage look and equally good vintage sounds. The guitar has a single-cutaway five-ply maple body, with two F holes, as well as a maple neck and rosewood fretboard, with 22 medium jumbo frets. Its twangy, sparkly vintage sound comes from two Blacktop Filter’Tron humbuckers at the bridge and neck positions, and is perfect for pretty much any style of music – in particular it’s excellent at emulating those sweet 50’s/60’s tones, with a great overdriven sound. With solid craftsmanship and playability, this is a hollow-body that will satisfy your thirst for vintage fun. Make sure to check out the full review of the G5420T here. The respected Swedish brand Hagstrom also make this list thanks to a popular reimagining of a classic model – the Tremar Viking Deluxe, which is inspired by the original 1960s Viking. 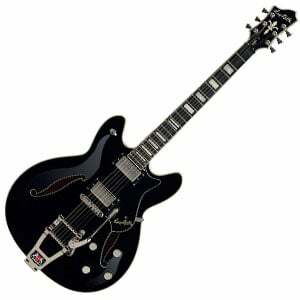 For a decent mid-range price, you are provided with a gorgeous semi-hollow body made of laminated flamed maple, enrobed in an elegant glossy black finish. The 22-fret Canadian hard maple neck is very nice to get around, while the hardware is also very commendable, including those cool tuning machines! As for electronics, the Viking is equipped with a set of Hagstrom HJ-50 humbuckers for some nice vintage tones – perfect for jazz and blues. Want more? Check out the full Tremar Viking Deluxe review! Meee-oow! This beautiful Wildkat from Epiphone has everything you could ask for in a small semi-hollow body guitar, with style, sophistication, and attitude in abundance. The Wildkat – reviewed in full here – features a mahogany body with a maple top, and is finished in pristine white, with golden trim and hardware, giving this a truly regal look. There’s a glued-in SlimTaper D-shaped maple neck, offering great sustain, with a rosewood fretboard and 22 medium jumbo frets. As for the sound, it’s fitted with two P-90 Dogear Classic single-coil pickups at the bridge and neck positions, offering a big voice – a little noisy at times, but with bags of character for everything from blues to soft rock. 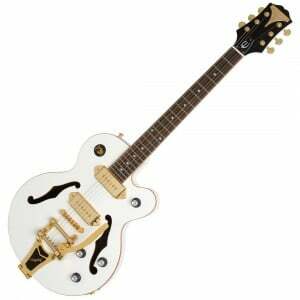 An excellent guitar for the price – Epiphone have done it again! Here’s an accomplished semi-hollow body guitar, injected with some classic Ibanez quality and flair. The resulting AM93 is a masterpiece, with sophisticated vintage styling and some great modern conveniences, making it one of the best jazz guitars around. The body – top, back and sides – is constructed from quilted maple, which is visually striking in either yellow or black finishes. There’s a three-piece mahogany and maple set neck, which offers good sustain, with a nice bound rosewood fretboard and 22 medium frets. It’s loaded with two golden passive Super 58 humbuckers at the neck and bridge, offering smooth jazzy tones, with enough bite for some blues and funk playing. Make sure to check out the detailed AM93 review for a better look at its features. This intriguing midrange model from the respected Chinese brand The Loar is built for performance, delivering a comfortable thin body and a generous Florentine cutaway to allow access to the higher frets of the 19-fret neck. With a 1.5” deep archtop body made from laminated maple, the LH-302T come in two color choices, both offering a lovely vintage-inspired look. Meanwhile, the playability on the sleek C-shaped neck is top notch. As we focus on in the main review of the LH-302T, this well-made hollow-bodied guitar features two dogear P-90s with flexible controls and a range of reliable hardware. Ultimately it makes for a very stage-worthy guitar for all styles of jazz, country and blues. As we mention in our full review of the Gretsch G100CE, this superb vintage model is heavily influenced by the 1940’s Gretsch Synchromatic 100 model. The modern remake is an elegant guitar, with a design and hardware that stays true to its 40’s art deco roots, including block neck inlays on the fretboard, a large faux-tortoiseshell pick guard, and a rounded 40s headstock, proudly displaying the Gretch logo. There’s a laminated maple back and sides with a spruce arched top, along with a laminated C-shaped maple neck and rosewood fretboard housing 20 extra broad frets. Comfortable and playable, and excellent maneuverability for jazz. 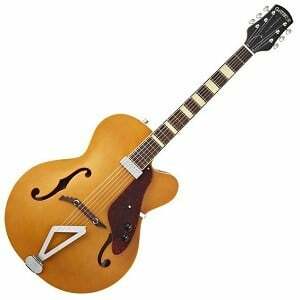 It features one Gretsch-designed single-coil pickup at the neck, with snappy sounds that are perfect for country, jazz and blues playing. An entry-level guitar from Fender that looks and plays anything but. 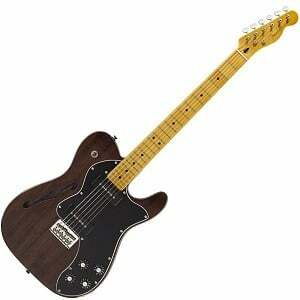 With the classic Telecaster single-cutaway body shape, there’s a semi-hollow mahogany body, with one F hole. It has a C-shaped maple neck, maple fretboard and medium jumbo frets, and is very playable – as you’d expect from a Tele. It comes loaded with two Modern Player MP-90 single-coils at the bridge and neck, with tone controls and a three-way pickup selector switch for a myriad of sound combinations. It sounds wonderful, with a full range of bright sparkly tones at the bridge. With a bit of overdrive it’s nice and gritty, and is perfect for classic rock playing. Excellent for a beginner, but experienced players will have just as much fun – check out the full Telecaster Thinline Deluxe review! Compared to the others, Johnson Guitars may be one of the smaller brand names on this list, but their JH-100-WNB Delta Rose makes an excellent model for beginners looking for their first hollow-bodied guitar. Featuring a compact body size, this affordable model is comfortable and fun to play, with a nice mahogany neck. For a wallet-friendly model, the spruce/mahogany build is commendable too, featuring an attractive Wineburst finish and cream binding. The full review of the Johnson Delta Rose takes a closer look at the hardware, which includes two pickups, flexible controls and a fixed bridge that all combines to deliver a decent tone and a reliable guitar for practice and jamming. Overall, great value. A good question, with an answer that ultimately depends on the kind of player that you are, or aim to become. Are you into fast rock or heavy metal? If so, chances are you aren’t even reading this page because hollow body guitars just don’t suit this kind of music – much like a Dave Mustaine “Angel of Deth” signature model wouldn’t appeal to jazz guitarists! A solid body guitar suits guitarists looking for heavier and louder sounds much better than a hollow body, because solid bodies offer more sustain, while avoiding the feedback issues that occur with hollow bodied instruments at higher volumes. On the flip side, hollow and semi-hollow bodied guitars appeal to those playing softer styles, such as jazz, country and blues, as well as soft rock and pop. Modern players such as Noel Gallagher, The Edge, and Dave Grohl have all used hollow bodied guitars to great effect, and there’s no reason you can’t either. These guitars tend to offer a full, rich and well-rounded sound with plenty of bass, while a semi-hollow is naturally very warm in tone and lend themselves well to lighter, more contemporary music. If you are a beginner, it’s probably worth sticking with a solid bodied instrument (and there are plenty of great solid bodied guitars under $200, as they offer a slightly easier platform to learn from. But make sure to try a few hollow and semi-hollows out, if you have the time and they are available to you. Why not? You may find something that resonates with your style, and make the best purchase you’ve ever made! Before you buy, make sure you try! We can’t stress that enough. Whether you are looking at purchasing in a store, or have found a bargain online, it’s worth your time to test out a few guitars to see if they work for you. Especially if you are looking at a used model. With these it’s imperative to try the guitar out through an amp to feel and hear any potential flaws – there may be a reason they are trying to get rid of it! If you can’t try out the exact guitar you want, reading in-depth reviews and watching videos online is the next best thing. This is a great way to learn everything you need to know about your possible next guitar. Check out some reviews on Guitar Fella, and good luck with your purchase! 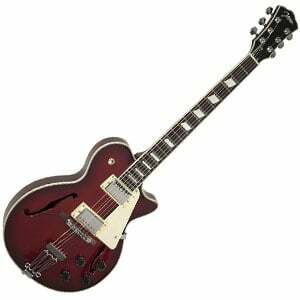 I think you should consider Ibanez Artcore AF 75 BS. It looks good, sounds good, and quite affordable. And one other thing. Maybe you also want to include Yamaha CPX 500II on your top acoustic electric guitar list. That guitar has built in tuner, volume control, and tone control. It is a good all around guitar, plugged or unplugged. Why would you not include a Gibson ES335/355? This list doesn’t cover guitars which are more than 1000 dollars. How about Epi Dot, Sheraton, or Casino? Hard to believe the Washburn HB35 was not on the list at $649. I use the HB35 in live venues and will place it against all at any price range. I absolutely agree Steven T, The washburn35 outperforms anything I have ever tried in semi-hollow body, bar none. The guild starfire III is right on the border cost-wise. You can find them new for just under 1,000. I think Guilds in general are very reliable. The pick-up quality is consistent across models. One of the only guitars I’d be comfortable buying on line. The starfire III would be unique on this list because of the mini-hums. It definitely produces an excellent warm jazz tone, but it’s much clearer than many of the guitars on this list and covers a bigger range of sounds. I play very heavy, very loud punk/metal on a semi hollow, it sounds heavier and louder than my other 12 guitars. I use a ton of distortion and play a lot of leads with pinch harmonics and such, the sound is bright but full using a gibson 498t in the bridge and a p90 in the neck with just one 500k volume pot. You can play very heavy music on a semihollow guitar.